I have a very special relationship with my guitars. I enjoy their rich sound as well as they beautiful wood grains. There are so many sizes and styles. I recently felt compelled to design and build a display unit to showcase their artistic quality and visual beauty. I wanted the guitar to be in a frame to exaggerate its artistic valve and to be very easily accessible so that it is always welcoming to be played. I wanted it to be very suitable to hang in the family room or living room so that it is always close to the regular heart beat of the family tradition. Any friends or neighbours that drop by should be tempted by the openly beautiful display unit to start something musical in the house. I really enjoy the many possible styles that can be used for each type of room and guitar. There is a very rustic, country, woody background or a more formal dark brown linen. Usually the choice helps to create a contrast in colour between the back drop and sides to the guitar. 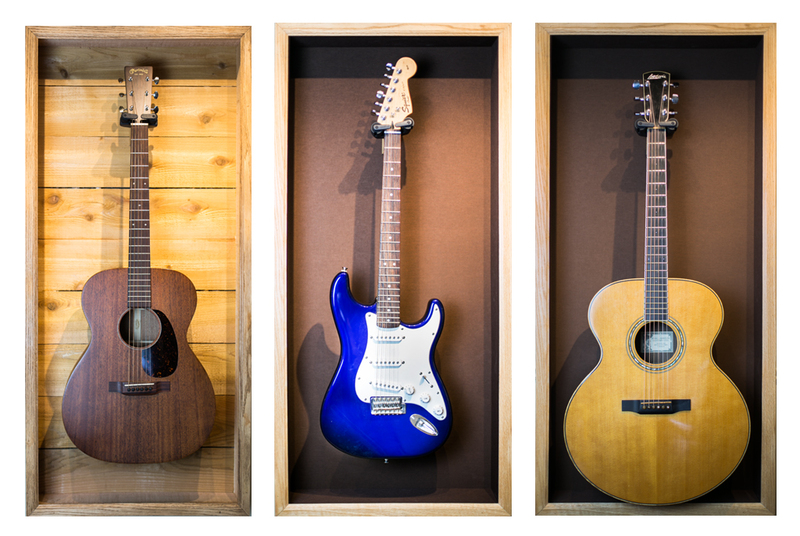 I endeavour to allow the guitar to stand out against the rich background of the display unit. Easy access is also very important as well as is keeping the the guitar very secure in the framing unit. The effort is to make the visual experience very inviting so it becomes almost difficult to walk by the guitar without picking it up.